It’s rare that we find a recipe so revolutionary that we feel obligated to make sure everyone knows about it. But this chicken is that and then some. James Beard Award-winner and two-Michelin-star chef Daniel Patterson shared it for our Winter 2015 issue, where he finished it with fried herbs and an herb vinaigrette. (It’s genius.) 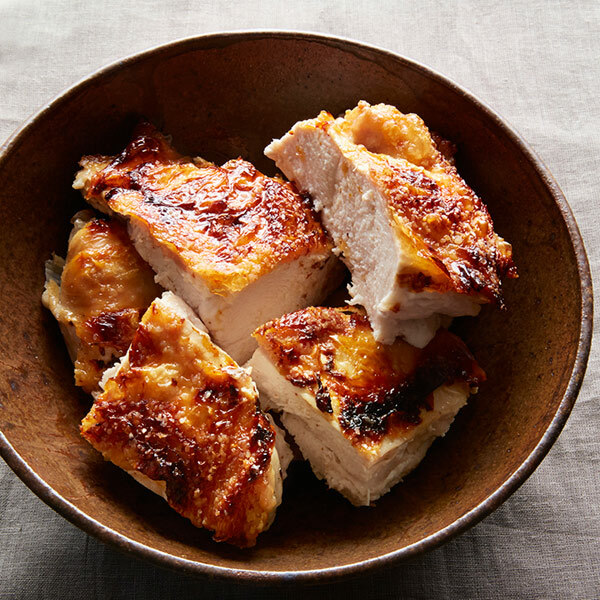 But the simple 2-ingredient, 1-minute-prep chicken is a revelation all by itself, especially because it’s the easiest recipe ever, feeds 6 for under $15, and every piece is the best piece (no bones + impossibly juicy meat + ultra-crispy skin = bliss). Do yourself a favor: Make this chicken. Then do us one in return: Show us your chicken via photo on Instagram and/or Facebook with the hashtag #besteffingchicken and @gffmag. We can’t wait to hear what you think! Salt the chicken with 1 teaspoon of salt 1 to 3 hours prior to cooking and reserve in the refrigerator until 10 minutes before cooking. Preheat the broiler. Put the chicken, skin-side up, on a rimmed sheet pan and place it under the broiler, about 3 inches from the heat, to brown and crisp the skin, about 10 minutes, rotating the pan a few times for even browning. Turn the oven temperature down to 250°F and cook for 25 minutes. Cut the chicken into entrée-size pieces, transfer to a platter and prepare to be blown away.